The luscious and ripe fruits and vegetables that are found at the grocery have most likely been treated to improve shelf life using carbon dioxide as a refrigerant or as gas to control insects and pathogens. Carbon dioxide is used to extend the storage length and flavor of fruits and vegetables by 50 percent to 100 percent, reports Adel Kader for the University of California. The addition of CO2 during the refrigeration process reduces the level of damage from chilling. Packages of certain vegetables are filled with CO2 to reduce spoilage. Fruits and vegetables are shipped all over the country in refrigerated trucks and shipping containers that use carbon dioxide gas to reduce decay, chill damage and time required for ripening. Carbon dioxide levels of 60 percent with 1 percent oxygen are effective in killing insects that may be hiding in leaves and stems of tropical fruits and vegetables, as stated in a report by Adel Kader. The gas fills the compartment during transport and prevents fruits and vegetables from ripening too quickly. The bagged lettuce industry uses CO2 extensively to prolong the freshness of lettuce. Lettuce is notorious for spoiling, and many leaf types are now packaged in bags that are filled with CO2 and oxygen levels of only 1 percent to 3 percent. This combination kills microorganisms that cause decay, as well as insects. The appearance of the lettuce may be beautiful and crisp right out of the bag, but there is concern that CO2 does not preserve the vitamins. 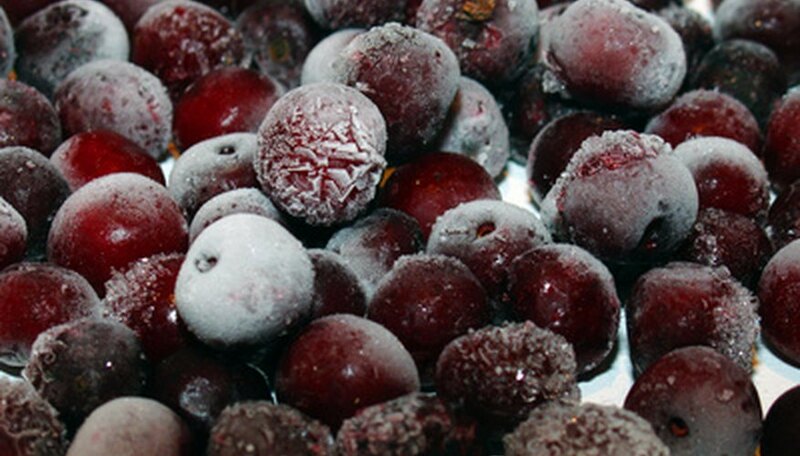 Fruits and vegetables are frozen and packaged for the grocery store using a method that employs the use of carbon dioxide in quick-frozen applications. Pipelines from CO2 storage tanks enter into the freezers, which deliver a mist of fine snow onto fruits or vegetables that are being frozen at temperatures of minus 60 Fahrenheit, according to Jim Lane for BioFuels Digest. This method of cryogenic freezing freezes food in a matter of minutes as opposed to hours using mechanical methods. Frozen foods using this method retain color and freshness much longer than foods frozen by mechanical methods. Traditional methods of killing insects on fruits and vegetables employed the use of methyl bromide fumigation, used by exporters. Insects must be killed on all imported fruits and vegetables, because their introduction into the ecosystems of the United States could wipe out entire food crops. The use of low-level oxygen combined with high CO2 levels kills all insects, including microscopic pathogens. It is a food-preservation technology that is much safer for humans and the planet. Using carbon dioxide for preserving fruits and vegetables saves money and time and prevents wastage of fruits and vegetables. Farmers, packagers and consumers all benefit from this. No consumer will purchase a fruit or a vegetable if its appearance is decayed or if bugs have destroyed it. Fruits and vegetables naturally mature by season; and with the use of CO2, crops can endure longer storage periods, making for a longer window of delivery of fresh fruits and vegetables to the consumer. "Biofuels Digest": Carbon Dioxide – Food Industry Applications and Usage, Jim Lane, September, 2008. 123 Food Science: Food Preservation: Modified Atmosphere. What Shade Cloth Density Allows Vegetables to Grow?